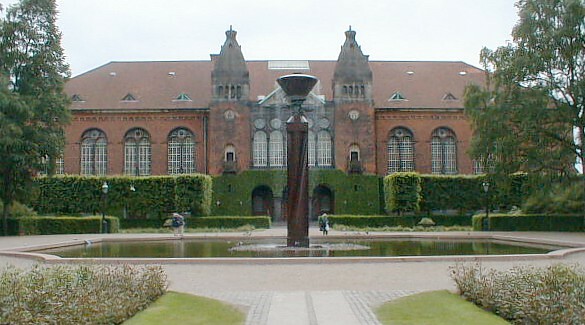 The main entrance to the old buildings from 1906 - of the Royal Library just opposite the Danish Parliament. The Royal Danish Library was founded by King Frederik III (1609-1670 - ruled Denmark and Norway 1648-1670) around 1648 and later in 1673 the library was established in a suitable building - just opposite Christiansborg Castle (The Danish Parliament). During 1661 and 1664 the King acquired four private libraries and their book collections formed the basis of the Royal Library. Peder Schumacher - later named Griffenfeld - became the King's librarian in 1663 - and in the following period he completed together with the King “Kongeloven” in 1665 (Lex Regis - Royal Law) - the constitution of the Danish absolute monarchy. Peder Schumacher was a learned librarian - and a widely travelled man - who bought books in Paris - Amsterdam and Venice - and also invited French bookbinders to Copenhagen. 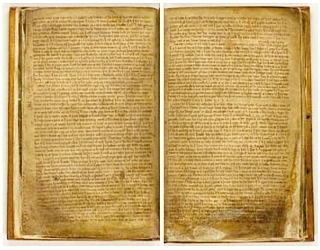 The Icelandic manuscripts were acquired in this period. Many great private book collectors knew the King's passion for books - and mostly they willed their collections to the King and to his new Royal Danish Library. 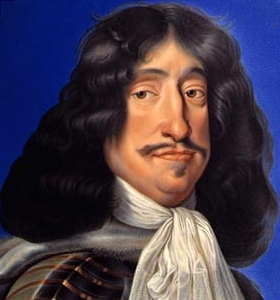 The new collections of valuable literature were added to the library - and when the founder of the Royal Library King Frederik III died in 1670 - the collection of books had reached over 20.000 volumes. 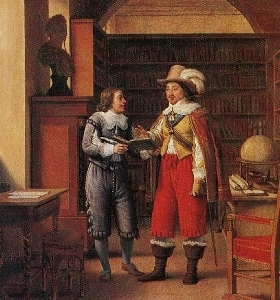 Founder of the Royal Library King Frederik III painted in 1663 - had a great passion for collecting books and acquires several private libraries that formed the present Royal Library book collection. Painting by C. W. Eckersberg in 1824 of King Frederik III with Librarian Peder Schumacher named Griffenfeldt, holding the new (Royal Law ) - constitution of Danish absolute monarchy in 1665. Slowly the collections were increased during the next century - mainly by attaining many private collections - and at the end of the 18th century the library had changed character and became both a scholarly as well as a national library. In 1793 the library was opened to the public - and in 1906 the present building on the Isle of Slotsholmen was inaugurated to house the Royal Library and the National Archives. Since the 17th century - several arrangements had ensured that all publications printed in Denmark had to be delivered to the Royal Library. The new building houses the first photographic studio in the library world - and the book stock increases to 800,000 vols during this period. 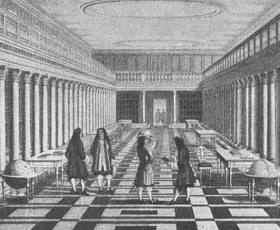 The grand hall in 1673 at the Royal Library in new premises opposite Christiansborg Castle. 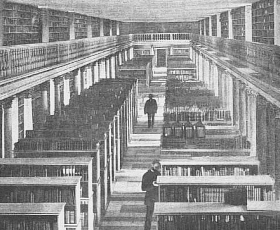 The great library hall in 1893 including King Frederik IIIs collection from 1670. In 1989 - the Royal Library and the University Library from 1482 merged into one institution with three locations under the patronage of the Ministry of Cultural Affairs. The University Library was stocked with a very rich book collection and manuscripts - which all were destroyed throughout the heavy fires of Copenhagen in 1728. With the help of many donations and book contributions the University Library was quickly re-established and at the beginning of the 19th century the number of volumes had increased to more than one million. The National Danish Collection includes: printed materials - such as books - journals - newspapers - pamphlets - printed in the Kingdom of Denmark since 1482 - including Scania (Sweden) until 1658 - Norway until 1814 - Iceland until 1944 - and the duchies of Schleswig-Holstein until 1864 - as well as Greenland and the Faeroe Islands. The oldest printed book in Denmark and in the Nordic countries is the Dalby book from 1060 - which was written on parchment paper. The book belongs to the Royal Library. The eldest book of King Frederik IIIs Royal collection was the book from Island named Morkinskinna from 1275 and is still in the position of the Royal Library. 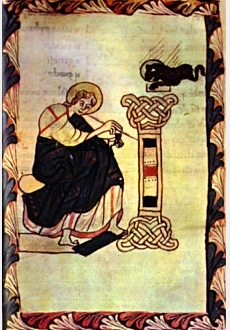 Among the medieval manuscripts from Danish monasteries are “Dalbybogen” - the oldest evangelical Christian book in Denmark - and the Nordic countries from Dalby around year 1060. The book is written on parchment paper - and is a precious part of the Royal Library’s collection - describing the Four Evangelists in writing - and supported with additional illustrations. One of the most remarkable music pieces ever composed was Tango Jalousie - Tango Tsigane. The music was composed in Copenhagen by the Danish musician Jacob Gade (1879-1963) - and performed for the first time at the Palads Cinema in Copenhagen on 14th September 1925 - as an accompaniment to a silent film. Tango Jalousie is one of the best known music pieces in the world - and has the firm record to be played every minute of the day somewhere on this earth. The original manuscript of Tango Jalousie by Jacob Gade is the property of the Royal Library and safely kept here. The manuscript was acquired by the Royal Library in 1993. 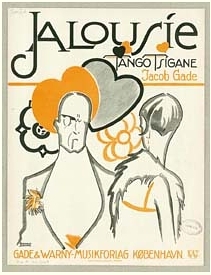 The original manuscript of Tango Jalousie was acquired by the Royal Library in 1993. In 1999 the Royal library's new building at Slotsholmen called “The Black Diamond” was inaugurated. In 2006 the Danish National Library of Science and Medicine merged with the Royal Library into one institution: "The Royal Library - The National Library and Copenhagen University Library". In 2007 the book stock in compress shelving will presumably be up about 170 km. The Royal Library is located opposite The Danish Parliament and Christiansborg Castle. 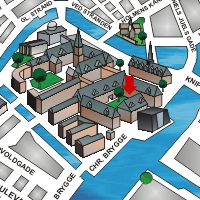 As a tourist visiting Copenhagen - we recommend that you to use your local library if you are seeking information about the city or just want to use facilities like Internet - fax - service - copying facilities etc. The Danish word for library is "Bibliotek". 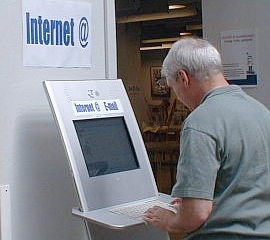 Use the libraries free Internet facilities. Sign up and get connected with friends all over the world. Read your free fresh newspaper - magazines etc. - in your own language at the local library. 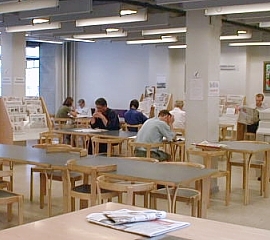 The libraries around the city and vicinities offers a large number of free services - and in some seldom occasions just charge a symbolic fee for assistance. Mostly all librarians speak more languages beside their native tongue and are very helpful - without bias - no matter what kind of assistance you ask for. You will always find the pulse of the cities atmosphere beating by just looking at the billboard -where you will achieve interesting information about local arrangements - activities and so one. Newspapers - Magazines - Books etc. A lot of free fresh daily newspapers from different countries are available as well as magazines and other popular reading stuff - and there is always a shelf with foreign books and literature you can lend during your stay. You can use the libraries Internet facilities free of charge to send an e-mail - or if you just want to check the news from your home country - flight and hotel reservations etc.. - You name it and the Internet has it! And the best part is - that some libraries also have open on Saturdays and Sundays too. The Central Library is located just a few blocks away from the Round Tower - and right in the old Latin Quarter of Copenhagen.